I must be in my blue period or something, because the past two nail art have been blue! 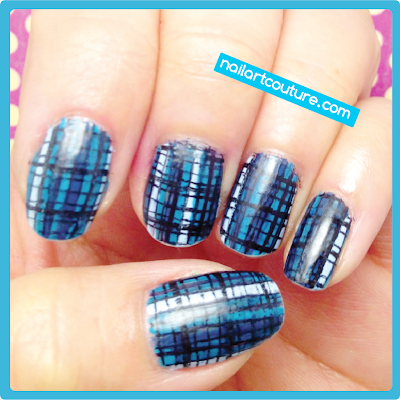 Anyways, in this post I'm going to show you how to create intricate plaid nails. People will think it's one of those nail decal stickers or something! You can use any colors you want, but I guess I just gravitate towards the blue hues this month. Again, I'm using my amazing 0.38 Muji gel pen to get the fine details of this nail art. I am seriously obsessed with this technique because it's so easy to control and you don't have to worry about globs of polish ruining your design. Seriously, never buy a black nail art polish with a striper brush! At first, I wanted to create a plaid cut out shapes inspired by a dress I saw online. But that proved to be more challenging than I imagined. Anyways, this is much easier than it looks. So if you are interested, follow the tutorial after the jump! Apply base coat to your nails and allow it try completely. 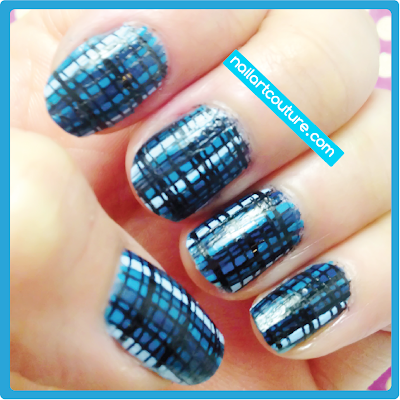 Using the full nail plaid image on the Konad M60 plate and black special polish, transfer the image onto your nails to use as a template. It doesn't matter if it is a little messed up because it will eventually be covered up. You may skip this step completely. Using a lighter blue polish, color over another one or two vertical strips. Using a navy polish, color the remaining vertical strip until your nails are covered. Ensure the nail polish is dried completely before you proceed with this step. Using the black gel pen, color in the black strip. Next outline all the strips vertically. Again the with gel pen and the stamped image as your template, create three bold black horizontal lines. Then create thinner vertical lines with various spacing. *If you sign up through the link, please let me know so I can Thank You! Firmoo Glasses Review: Get your FIRST PAIR FREE!